Coronal mass ejections (CMEs) are immense eruptions of solar plasma and magnetic fields. When a CME strikes a planet, it can have huge effects; over billions of years, CMEs can strip away a planet’s atmosphere. 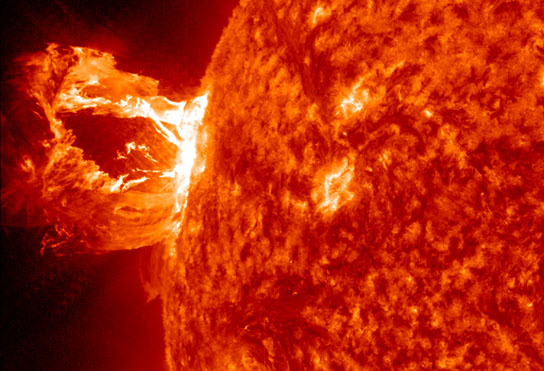 In the short term, CMEs wreak havoc at Earth by causing dangerous and costly geomagnetic storms. In 1859, a CME impacted the Earth and caused the most intense geomagnetic storm ever recorded, resulting in stunning auroral displays over much of the northern hemisphere (Figure 1) and widespread failure of telegraph systems. An event of this magnitude today would cause huge damage to power grids, satellites, and oil pipelines—resulting in a trillion dollars of damage in the United States alone. So, how can we prevent this from occurring? Enter the growing field of space weather forecasting. Although we can’t stop the Sun from ejecting CMEs, we can try to figure out if a given CME will hit the Earth, and how severe the resulting geomagnetic storm will be if it does. The severity of a geomagnetic storm is linked to the CME’s magnetic field conditions, especially the magnitude of the southward-pointing magnetic field (i.e. the component of the magnetic field that opposes the Earth’s magnetic field at the equator). If the CME’s properties can be accurately estimated, the severity of the resulting geomagnetic storm can be estimated too, allowing for power grids and satellites to be put into safe mode if necessary. Astrobites is a daily astrophysical literature journal written by graduate students in astronomy. Our goal is to present one interesting paper per day in a brief format that is accessible to undergraduate students in the physical sciences who are interested in active research. Reading a technical paper from an unfamiliar subfield is intimidating. It may not be obvious how the techniques used by the researchers really work or what role the new research plays in answering the bigger questions motivating that field, not to mention the obscure jargon! For most people, it takes years for scientific papers to become meaningful. Our goal is to solve this problem, one paper at a time. In 5 minutes a day reading Astrobites, you should not only learn about one interesting piece of current work, but also get a peek at the broader picture of research in a new area of astronomy.